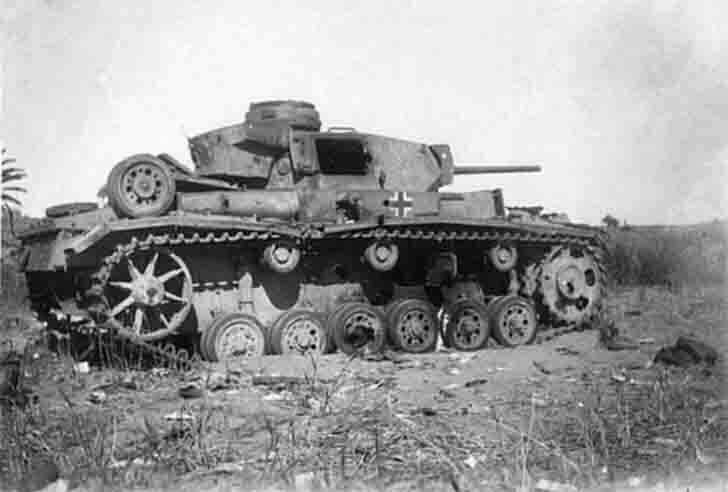 Destroyed German Pz.Kpfw. III of, presumably, Ausf.J, medium tank with a 50-mm cannon, the 11th Panzer Division. North Africa. Pz.Kpfw. III – Panzerkampfwagen III – German medium tank of World War II, commercially available from 1938 to 1943. Abbreviation of the tank were the PzKpfw III, Panzer III, Pz III. In the departmental military vehicles heading Nazi Germany, this tank had the designation Sd.Kfz. 141 (Sonderkraftfahrzeug 141 – special-purpose vehicle 141).